When in 1492 Christopher Columbus set out for Asia but instead happened upon the Bahamas, Cuba, and Hispaniola, his error inaugurated a specifically colonial modernity. This is, Security and Terror contends, the colonial modernity within which we still live. And its enduring features are especially vivid in the current American century, a moment marked by a permanent War on Terror and pervasive capitalist dispossession. 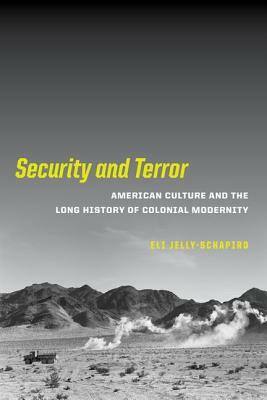 Resisting the assumption that September 11, 2001, constituted a historical rupture, Eli Jelly-Schapiro traces the political and philosophic genealogies of security and terror—from the settler-colonization of the New World to the wars in Afghanistan, Iraq, and beyond. A history of the present crisis, Security and Terror also examines how that history has been registered and reckoned with in significant works of contemporary fiction and theory—in novels by Teju Cole, Mohsin Hamid, Junot Díaz, and Roberto Bolaño, and in the critical interventions of Jean Baudrillard, Giorgio Agamben, Judith Butler, Michael Hardt and Antonio Negri, and others. In this richly interdisciplinary inquiry, Jelly-Schapiro reveals how the erasure of colonial pasts enables the perpetual reproduction of colonial culture. Eli Jelly-Schapiro is Assistant Professor of English at the University of South Carolina, where he teaches contemporary literature and culture. "With a lucid and accessible tour of political theory . . . [Jelly-Schapiro] prepares his readers for astute interpretations of several recent fictional texts and films . . . The book is cultural studies at its best."